Anti Fed Ed Warriors, we’re quickly approaching a new school year (2017-18). It’ll be another year of contention for those who are dead-set against the CCSS Machine. Over the summer, many of us have continued to chip away at the facade of how ‘local’ ESSA (Every Student Succeeds Act) is and the true identity of the global, UN (United Nations) grasp over our federal government’s adherence to the modern education reform. Would You Know What the Global CCSS Machine Values Are? Warriors, did you know that the UN has ROI (Return on Investment) formulas for education? These formulas, of course will include assessements (tests), teaching, and other factors. However, it’s not the student who will come out the winner, but the businesses AND economy which will reign supreme in education. Why? Workforce based, skilled citizens. If the UN has such, we can ‘bet the bank’ the USA does, too. For example, back in 2014, I wrote an article about a local meeting which laid out the intersecting of the working world, politicians, and education. Oh, and, yes, the business world was represented by the State level Chamber of Commerce. Look below for a sample of what I shared then. To see and read the rest of the article, go here. If you’ve not seen how the P3s (public private partnerships) influence your local education system, visit here. Warriors, we must remember, P3s are increased in power, thanks to ESSA. Globally speaking, their power is enormously strong, as well. The SDGs (Sustainable Development Goals) provide the way for this across the globe. Here, in America, a series of federally passed laws provide the way. Chief among them are: ESSA, WIOA, HEA, the STEM Act, and many more. If you missed how the P3s are running higher education as a ‘return on investment’ for the economy, check out my 2015 article where you’ll see your students on a wheel. Also, Warriors, keep in mind, the big corporations are not the only investors in ‘education’. The SBA (Small Business Administration) is knee-deep in the alignment/investing ploy, too. These will be the more ‘local’ overreaches you see today. Warriors, we know of plenty of American career tracking, but what about the international career tracking and/or skill based tests? Are there any? Of course! Back in March 2017, I shared with you the ties between American and the PIAAC (Program for the International Assessment of Adult Competencies). This test measures our adults (and thus, teachers, education leaders) and their ‘value’ to the economy. So, how does all this tie to the UN’s SDGs?! Watch the short video below. It features a school leader (early 2017) explain ‘rigor’ in the global scheme of things. While I listened to this man, I heard so many words with very little meaning. (A classic tool of the CCSS Machine) This school is an American school (Ranney School in NJ. It’s an independent school which is a UN partner school. Ranney School also is con-joined with Monmouth University as another UN partner school. How did I find out about the NJ schools and their UN partnerships? Their project is being tracked in real time by the UN itself! If you’d like to see the entire results, go here. Be sure to look for the ‘measured outcomes’ of the project. If you’d like to see more about this from Ranney’s media, I urge you to access it here. Is the Ranney School exclusive in the US as a UN partner? Hardly. It’s simply an example for this article. According to the UN’s SDG Initiative Tracking website, there are 524 other global education partnerships in progress right now. If you’d like to see them, find them here. However, remember, Warriors, education is the preferred ‘change agent’ so the alignment in education will be in ALL 17 goals for SD (Sustainable Development), not simply one. This un-dated World Bank “education return on investment” shows how education and growth for economics should be a hand-in-hand process. UNICEF (a part of the UN), in their 2015 Report, stress a hefty return on investment via education of up to 30%. How the USA rates ‘returns on investment’ in education can be found on the website “U.S. Global Leadership Coalition”. The member organizations and corporations for the US GLC include some of the biggest CCSS Machine groups. Find them here. Back in 2016, MarketWatch’s website suggested we ‘moneyball’ education. Maybe they read ESSA better than those who voted on it. Moneyballing is exactly what will be happening more and more in American classrooms of all ages. We can also expect those bankrolling education will have many strings in the way education is conducted. Expect more of a business, not a labor of love, Warriors. Do the better ‘thing’, the ‘smarter than the global-UN/US thing’: Don’t send your students back to school! Hug them instead, talk with them about their TRUE value and worth. It is beyond ANY amount of money! We’ve all had discussions about education. Some of these ‘talks’ are pretty easy; some others aren’t. With most of us back home and resuming our post-Thanksgiving lives, it is easy to think about what was said around the table. My family is no exception. Most of the family’s offspring are up in age. A few, however, have little ones. By little I mean ’10 years and younger’. My most ‘in-depth’ education conversation wasn’t with one of the grown-ups. It was with a 7 year old. My heart still hurts when I recall his face and body language. Warriors, I do not know about you, but this was something, no one, not even a Warrior Parent had shared. Since parents are being left out of education so much, these Warriors may not know about the ‘good color/bad color’ strategy in the classroom. Maybe they do and are fighting so hard against it, it’s assumed everyone knows. It doesn’t matter. What DOES matter is looking at how this strategy is reshaping (literally) our children’s mindset. Warriors, I found this example on Pintrest, along with hundreds of other color behavior management charts. Since I do not know exactly what school my young kinsman attends, I cannot access his school directly. So, where’s the ‘agenda’? PBIS (Positive Behavior Interventions and Supports) While the screen shot you see above may or may not co-ordinate with the particular school district I’m referring to or not, the PBIS, thanks to ESSA, (Every Student Succeeds Act) is only going to get more invasive. An added ‘bonus’? The amount of money to be made by private companies which partner with schools. ESSA gives that opportunity many times in the Law. Related to what is happening NOW in behavior management, is this screen shot from a 2014 article I published which revealed to you the Behavior Standards used in schools which aligned to Common Core. You can see how the PBIS will fit into schools. It doesn’t matter what name the States use for educational standards, the behavior portions will remain in place and yet, will INCREASE in overreach! From the school district information I found that the Positive Behavior uses not only colors (think a traffic light), BUT coins as rewards to use for ‘shopping’. So, what is the school district I found using for PBIS? colors as ‘good’ or ‘not good’ (‘bad’ is not an option); and, levels of keeping behaviors in line with every other student (for example: blue level or gold level, the higher the color, the more the responsibility). Warriors, do you see how music is used in the cafeteria?! Do you see how much silence is expected?! Do you see how often lines are to be used or order is to be kept?! Why would school information be located at an economic website? The workforce agenda!! “College and Career Readiness” doesn’t just involve education, it arches over into jobs. Jobs drive the local economy. ESSA and WIOA (Workforce Innovation and Opportunity Act) use Career Tech Education and Career Pathways (sometimes Career Clusters). The Higher Education Act (HEA) also plays into this! The Ultimate Goal for the students in Greenville School District (as well as a national goal we see playing out in ‘real time’)? The screen shot shows only a portion of the information. The entire 2 page brochure reveals the ‘building’ begins in Pre-school! Warriors, we all are at risk of losing our students to the CCSS Machine’s workforce agenda. It doesn’t matter how young or old our students are. By using colors to encourage or discourage young minds, we condition them unjustly. By using music as cues to be ourselves and chat with others or not, we are restricting personalities. By showing instant gratification for ‘good’ behavior, we are seeing the entitlement programs increase in society. What’s my little kinsman’s future?! Sadly, like all the rest of ours. A ‘color coded credential for work’ where we are all ‘bronze, silver, gold, or platinum’ workers…not free people with hopes and dreams. the rest of his message? An empty vat of lies. This screen shot is from a brochure for an upcoming conference. As I’ve done in the past, I’ll be using NC as the example from which you can use to see what’s up like it in your state. 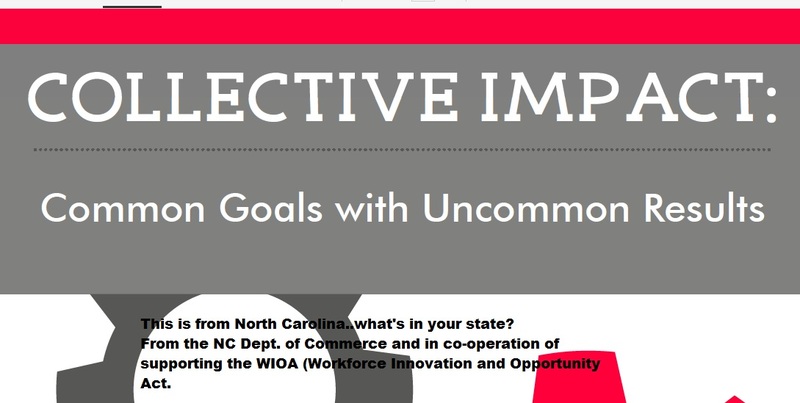 So, knowing the Workforce alignment is going on as we speak; knowing we can trace the funding, where should you look in your state for such activities? 6) any regional or city-to-city partnerships your state has. These are all the places you’ll find ARRA funds; Workforce education aligned to CCSS and all under the guise of ‘collective communities’. 7) Look into your state laws/statutes. Here in NC, there are several which are in place already and some which will be re-written to further support all this alignment. For example, NC General Statute 150B-21.3A (adopted in 2013) lays out all the rules for ‘streamlining’ the ‘creation of jobs’ in NC. 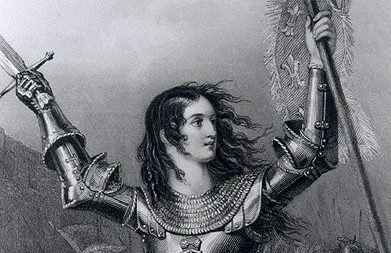 Warriors: if we ignore the rules of government on a state and local level which cater to the CCSS Machine, we’re doomed! We must look into our state laws and demand the citizens be heard. You’ve seen the evidence that more folks are against the CCSS than are for it. If we don’t attack the CCSS Machine on all fronts, we’re going to continue to see our nation suffer! CCSS is NOT just for K-12. Up to this point, you’ve not seen anything in documented proof which states the Career Tech Education (or any of its other names) or CCSS is specifically tied to the WIOA, NCWorks, or the ARRA funds. So, where are the CTE/CCSS/Career Pathways, etc. hiding? When you look into it, be sure to note that the “NC Prosperity Zone Map” is also included. 1) the businesses receiving funding to help in the job creation/education ‘marriage’. 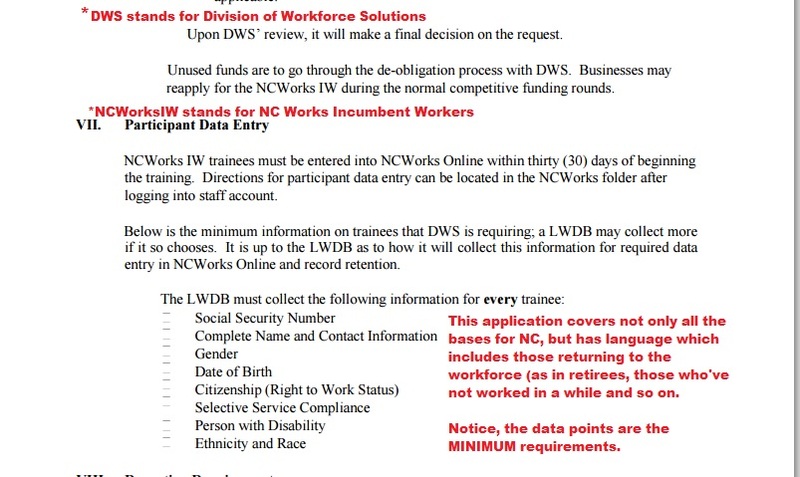 A brief look at a 2015-16 application for funds to continue Workforce activities. The ‘catch’ for any disadvantaged participant? They MUST have a Career Readiness Certificate. (CRCs are CCSS/CTE aligned) You can find the CRC requirement on pages 3 and 4 of the above document. Oh, by the way, NC will award business for their participation in these programs. The CP for disadvantaged comes with a $150,000.00 ‘incentive’! This ‘smooze fest’ of CCSS/CTE/Career Pathway enthusiasts is set for October 28-30, 2015.